Streamlined Backshop Services is now offering our LED Power Supplies and Other Lighting Lighting Kits for sale. Bring your varnish, business cars, crummies, hacks, and vans to life with the brilliance and intensity of LED lighting and harness the power of DCC for your cabeese and passenger car fleet. The modules are designed to add marker lights, interior cabin light, drum heads, or any other light type easily to your models. Perfect for the Do-It-Yourselfer's in the crowd. The SBS4DCC lighting Modules will help make your lighting installations look professional and function flawlessly. This modules DO NOT include any pickups, LED's or other lighting products. Be sure to visit the store today for a wide selection of LEDs to make your project complete. The SBS4DCC Compact LED Constant Lighting - Anti-Flicker Module is R-T-R and contains all of the electronics required to add track powered lighting to your caboose and passenger car fleet. 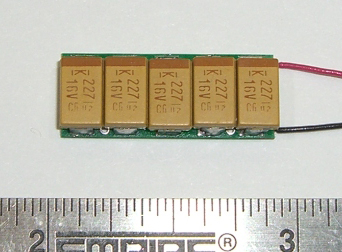 The electronic assembly measures approximately 0.752 x 0.236 x 0.251 making it ideal for use with all scales including N and HO scale. The assembly includes a 440uF capacitor which will provide plenty of anti-flicker protection. Our tests show that the strip will remain lit for over one seconds after power is removed from our LED circuit. The assembly also includes a 1000 ohm resistor to "dim the lights" down a bit. The Compact Module includes In-Rush Current Protection on the Capacitor circuit to prevent tripping breakers on power up and resets. 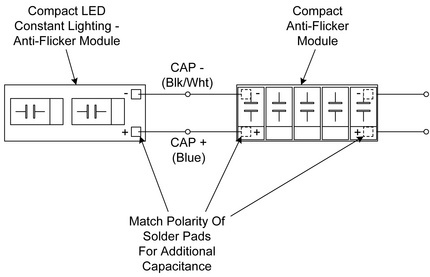 The capacitance value can be easily increased on the Compact Module by adding our Anti-Flicker Module. The unit comes with 6" power input leads (Red and Black) and 3" power output leads (Blue and White). The SBS4DCC Compact LED Constant Lighting Module is R-T-R and contains all of the electronics required to add track powered lighting to your caboose and passenger car fleet. 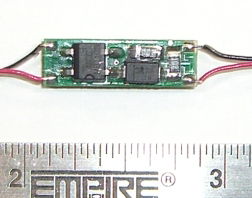 The electronic assembly measures approximately 0.752 x 0.236 x 0.149 making it ideal for use with all scales including N and HO scale. The assembly does not include anti-flicker protection. The Compact LED Constant Lighting Module is made exclusively by Streamlined Backshop Services for use with our truck pickups and decoder installation services. The SBS4DCC Compact Anti-Flicker Module is R-T-R and contains all of the electronics required to increase the anti-flicker capacitance value of many of SBS4DCC lighting products. 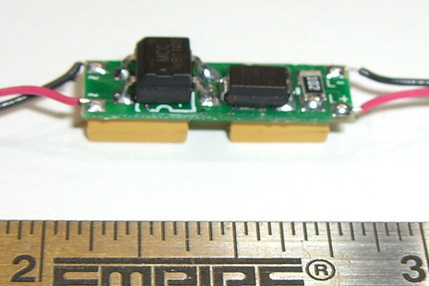 The electronic assembly measures approximately 0.882 x 0.351 x 0.158 making it ideal for use with all scales including N and HO scale. The assembly includes a 1100uF capacitor which will provide plenty of anti-flicker protection. Our tests show that the strip will remain lit for over three seconds after power is removed from our LED circuit. The unit comes with 3" power output leads. The blue wire is (+) positive, the black/white striped wire is negative. The Module can be used in place of any capacitor in other applications just be sure to observe the polarity of the output. The Compact Anti-Flicker Module is made exclusively by Streamlined Backshop Services for use with our lighting kits and decoder installation services. Using the Compact LED Constant Lighting Module is very straight forward. First, connect the red and black wires to track power. It does not matter which color goes to which rail but for the sake of consistency, red is right rail where normal direction of travel (NDOT) is forward. Then, connect the blue and white wires to your LED. Blue is positive (+) and white is negative (-). The unit is made with a 1000 ohm resistor connected to the negative output so additional resistance is not required for typical 3.2fV 20mA LED's when used as shown. Additional resistance can be added to the circuit to reduce the brightness of the LED's. 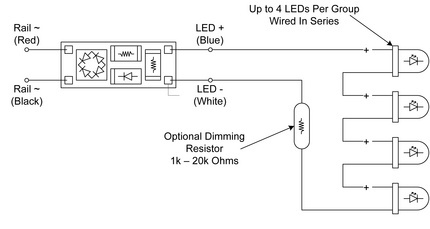 If connecting more than one LED to the module, it is best to wire them in series as shown. If wired in parallel, you will need to add a 1000 ohm resistor to the cathode of each LED. If you are using more than four LED's in your project, divide them up into multiple groups with each group having exactly the same number of LED's. 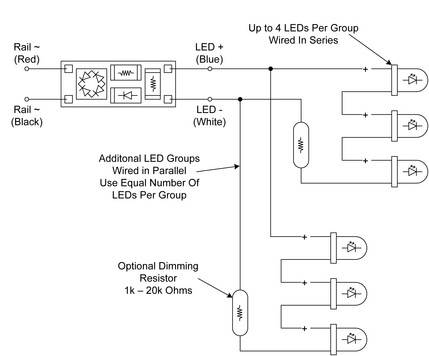 LED's within each group should be wired in series and the groups should wired together in parallel. The Compact Anti-Flicker Module can be added to the LED module (and many other SBS4DCC products) to increase the anti-flicker and keep-alive performance of the circuit. With respect to the Compact LED Modules, simply connect the blue wire from the Anti-Flicker Module to the solder pad marked (+) on the bottom side of the LED Module and the black/white wire to the solder pad marker (-). Additional Anti-Flicker Modules can be added by connecting the blue and black/white wires to the respective solder pads on the bottom of the A-F Modules being sure to match the polarity of the wire to the respective solder pad.